Officials made an arrest on Feb. 7 in Los Angeles in an operation by Immigration and Customs Enforcement. In 2014, the Obama administration issued guidelines for deporting unauthorized immigrants that placed the highest priority on gang members, and those who posed security threats. A goal was to concentrate limited resources on the most serious cases, but many Immigration and Customs Enforcement agents complained that the priorities tied their hands, taking away their discretion as to whom to pursue. Under the new directives, the government “no longer will exempt classes or categories of removable aliens from potential enforcement.” Immigration agents can now focus on picking up and removing anyone charged with or convicted of any criminal offense, even minor ones, as well as anyone already ordered deported, regardless of whether they have a criminal record. One unauthorized immigrant in California, Kristina, who did not want her last name used because of fear of deportation, said she was alarmed to learn on Tuesday that she would now be considered a prime target. Kristina has been in the country for 25 years and has been ordered deported, but her removal had been postponed for the last four years by the Obama administration. Under the Obama administration, people caught crossing the border without permission were often released into the United States while their requests for asylum wound through the immigration system, a process that can take years. Most requests are denied, but by then, the immigrant has been living in the United States all that time and may not be easy to find. The Trump administration has declared an end to the so-called catch and release policy, though it may take a while to see any significant change. “Catch and release” came about in part because the government had nowhere to hold detainees waiting for immigration decisions. One of the memos released Tuesday directs officials to expand detention facilities, but it will take time to build centers big enough, or find enough room in jails, to hold the thousands of Mexican and Central American asylum seekers expected to cross the border this year. The document also raises another alternative: sending migrants back to Mexico to wait out the immigration process, even those who are not originally from Mexico. That proposal comes with its own problems. Though U.S. law appears to allow it, Mexico’s laws do not, if the immigrant is not a Mexican citizen. Two decades ago, Congress passed a law allowing the government to quickly deport unauthorized immigrants who have not been in the United States very long, without allowing them go before a judge. In practice, the government has used this process, called “expedited removal,” relatively narrowly because of concerns about whether it violates constitutional rights of due process that are granted to anyone in the United States, regardless of immigration status. Since 2002, expedited removal has been applied only to immigrants who have been in the country less than two weeks and were caught within 100 miles of the border. That is because the Supreme Court has held that such immigrants can still be considered “in transit” and not here long enough to qualify for due process protections. The Trump administration is now planning to use expedited removal as extensively as the original law allows, saying that limits on its use had contributed to a backlog of more than half a million cases in immigration court. Immigration advocates vowed to challenge the change. One of the memos Tuesday acknowledges that children who arrive at the border alone — “unaccompanied alien children,” in government parlance — are entitled to special protections: Unlike other border crossers, whom border patrol agents may deport without a legal hearing, these children must appear before an immigration judge and be interviewed by an asylum officer. Children have surged across the border in recent years, many fleeing violence and destitution in Central America. But the memo turns a sterner face to their parents, who, under the new policy, may be subject to deportation or even prosecution for enabling their children to come into the country. The memo notes that parents and relatives often pay smugglers several thousand dollars to bring their children from Central America, an act that the memo says amounts to facilitating illegal smuggling or trafficking. Immigration advocates are predicting that the policy will drive parents of migrant children further underground. With parents fearful of prosecution, advocates say, navigating the immigration process — or even showing up to court — could become much harder for these children. So far, the Trump administration has left the program alone. But chills went through the community of “Dreamers,” as DACA recipients are known, with the recent arrest of a 23-year-old Mexican immigrant in Washington state, Daniel Ramirez. Immigration agents arrested him when they went to his house to detain his father, a convicted drug trafficker. They said Ramirez admitted to having gang affiliations, which cancels the protection offered under DACA. But Ramirez denies having made the admission, and his lawyers are fighting his deportation. 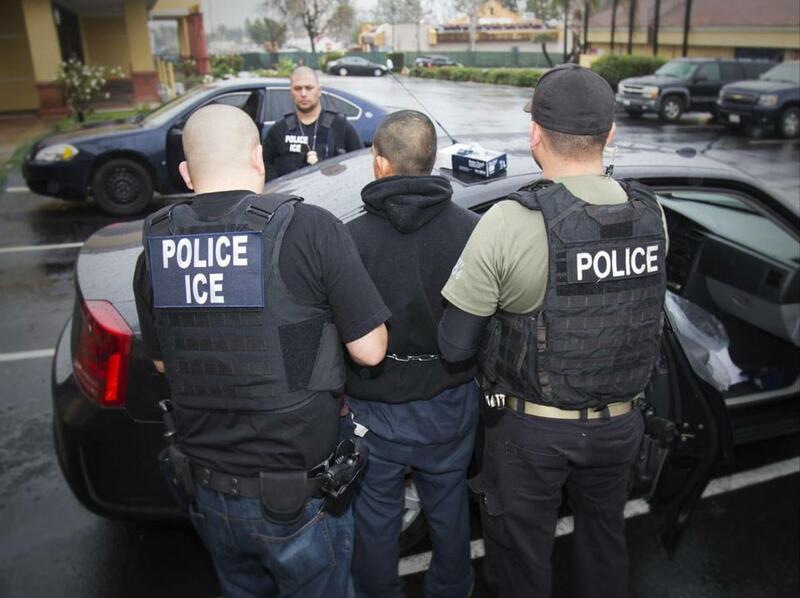 A program known as 287(g), named for its section of the Immigration and Nationality Act, allows the Department of Homeland Security to train local and state law enforcement officers to work as de facto federal immigration officers, identifying undocumented immigrants in their communities and jails and turning them over to Immigration and Customs Enforcement. From 2006 to 2013, the program led to 175,000 deportations, according to federal statistics. But investigations and court rulings revealed an ugly side effect: In some jurisdictions, local officers were using their authority to racially profile Latinos. One of the most egregious cases was in Maricopa County, Arizona’s most populous, during the tenure of Sheriff Joseph Arpaio, who a federal judge ruled had discriminated against Latinos in patrols and other enforcement efforts. The Obama administration curtailed the use of the program, which currently involves 32 agencies in 16 states. The Trump administration wants more agencies to take part, and some have already expressed a desire to do so. The administration is trying to significantly expand the amount of information available on the enforcement of immigration laws and, in particular, unauthorized immigrants who commit crimes. Immigration and Customs Enforcement will establish a new office to work with the victims of crimes committed by undocumented immigrants, some of whom appeared with Trump on the campaign trail. The office, known as Victims of Immigration Crime Engagement, or VOICE, will provide victims with information about defendants’ immigration status and whether they are in jail. Significantly, funding for the office comes from reallocating “any and all resources that are currently used to advocate on behalf of illegal aliens” by Immigration and Customs Enforcement. ICE will now have to provide monthly public reports on its apprehensions and releases. The agency also has to publish a weekly report about state and local authorities that release unauthorized immigrants from jails. That is a clear shot across the bow at so-called sanctuary cities that limit their cooperation with federal immigration authorities, contending that turning in unauthorized immigrants would destroy the fragile relationship that police have with immigrant communities. “We are going to continue our policy that has been in place because we think that it helps us have a safer, stronger, better community,” Mayor Stephanie A. Miner of Syracuse, New York, said Tuesday. The Trump administration is already pondering ways to punish those cities by denying them some federal aid. “Now everyone is going to be able to see how many criminal aliens are being released as a result of the sanctuary policies,” said Jessica Vaughan, director of policy studies at the Center for Immigration Studies, which supports tighter controls on immigration. In January 2009, the departing Bush administration extended some Privacy Act rights, which U.S. citizens and legal permanent residents already had, to unauthorized immigrants. That meant that information obtained by one agency, like the Internal Revenue Service or Citizenship and Immigration Services, could not generally be shared with other agencies, like Immigration and Customs Enforcement. One rationale for the move was to protect the personal information of immigrants who might one day become citizens covered by the Privacy Act. The Department of Homeland Security said it would develop new rules on the sharing of unauthorized immigrants’ private information. But advocates for immigrants said they feared that those who had applied for legal status — in the process divulging they were not here legally — were now in danger of having that information used to deport them. The memos released Tuesday repeat Trump’s demand in his executive order for a larger enforcement force that can speed up the removal of millions of immigrants illegally in the United States. In practice, that may play out more slowly than the president might prefer. The source of this caution is none other than John F. Kelly, the homeland security secretary, who told lawmakers this month that he did not believe it would be possible to hire the desired 15,000 ICE and border patrol agents in the next couple of years. On top of the stringent hiring standards and training, Border Patrol applicants are required to take a polygraph test, which nearly 60 percent fail. A previous surge in hiring under President George W. Bush resulted in dozens of corruption cases, with Border Patrol and other agents accused of taking bribes and providing information to Mexican drug cartels.